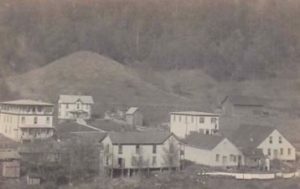 The tiny town of Huntdale, NC, became a thriving community after the Clinchfield Railroad made its way through the Nolichucky Gorge in the early 1900s. In 1890, the Clinchfield tracks reached Erwin, TN, which was less than 20 miles away from Huntdale. Many Western North Carolina communities felt the huge spike in economic success due to railroad construction, but none quite like Huntdale. The river and proximity to the state line made it a prime spot for commercial profit, and it drew interest from miles away. Locals still remember a time when salesmen rode in on the Clinchfield passenger train from Johnson City, TN, and would be accommodated by a 3-story Hotel operated by Ernest Griffith and his family. Passengers would be dropped off at the train depot and would stay the night. Horses were available to rent the next morning for traveling, and the original stalls with numbering can be seen on the 100-year old barn that still stands. Visitors to Huntdale could enjoy a dance hall on Friday nights, fresh ground meal from the local mill on Saturday mornings, and household goods from the general store during any day of the week. The General Store was a 2-story building that sold everything from tools to groceries, and community members congregated regularly to loaf and pick up everyday items for their families. 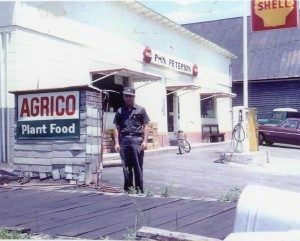 Originally the store was under the operation of the Griffith family, but was taken over by Phin Peterson (1913-1999), who purchased the land and buildings from the Griffiths. Operated since 1982 by Lynn Peterson, son of Phin and Effie Bennett Peterson, the store is still running after all these years, making it one of the oldest still operating country stores in Mitchell and Yancey counties. A post office was also located in Huntdale from 1900 to 1951 so local families could regularly get their mail. Homes were built in confidence as Huntdale became a bustling community that all were proud of. 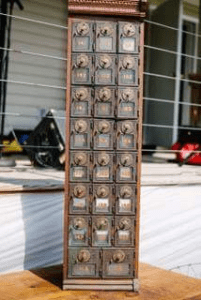 Post Office Boxes from Huntdale P.O. There is no doubt that Huntdale has had a big impact on businesses and families all around. Though times have most certainly changed, local residents still feel that same pride today as they did over 100 years ago, and Huntdale will always be remembered as an unforgettable town. Photos and details provided by Macie Peterson.